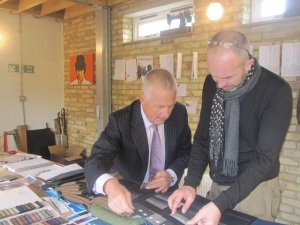 Based in West Yorkshire, Huddersfield Fine Worsteds is an internationally renowned fabric manufacturer supplying the world's biggest design houses and most prestigious tailors with superior and selectively-sourced fabrics. Combining innovation in their designs, and tradition in their outlook, HFW is the epitome of British elegance with global appeal. home > HOME > Who are We? Based in Elland, just outside Huddersfield, we are at the heart of West Yorkshire’s Textiles Country. Our small team of experts work from our modern warehouse and office facility, within easy reach of our Spinners, Weavers and Finishers. Many of our staff have spent their working lives in the industry, resulting in a wealth of knowledge to pass on to our customers. 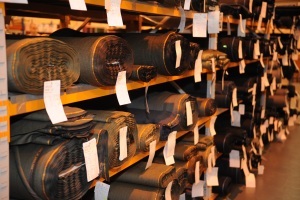 Whatever our background, from Sales, to Production, Warehouse Staff to Accountants, we all have a passion for fabrics. 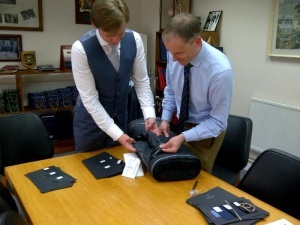 Our small team of Sales staff regularly visit customers around the country, updating them with new product developments. They actively help source the right cloth for clients and work in partnership on new ideas and promotions. Our dedicated London Account Manager also makes daily deliveries to our customers on Savile Row, from our small office in the West End. Click here to contact us. Our Brand Hardy Minnis is credited with being the first Cloth Merchant to export British Suitings to Japan and to this day HFW continues to trade around the world, with representation in 13 different countries. Click here to contact us. Checkout our new website and tell us what you think. © Huddersfield Fine Worsteds Ltd 2019. All Rights Reserved.